This year a food item I always loved was discontinued. Well, it was more of a seasoning, but bear with me here. At first it was hard to find in some grocery stores, then Walmart had some bags of it but once those were gone none returned to refill the shelves. Eventually it became apparent that yes, Kraft Fresh Take was cancelled. 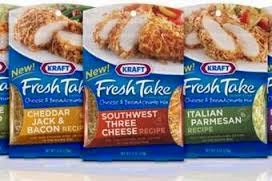 Kraft Fresh Take was like a shake-and-bake deal where you could take your chicken or pork chops, and shake them up in a bag of deliciousness. You went from having a dull raw piece of meat, to dipping it into heaven, and after letting it cook in the oven for awhile taking it out and devouring the tastiest pork chop you've ever had. I myself loved the "Cheddar Jack & Bacon" recipe along with admiring the "Southwest Three Cheese". I could take-or-leave the "Four Cheese" one however, and wouldn't hesitate to pass on the "Italian Parmesan". I really loved "Fresh Take" but apparently not enough people did because it's discontinued. Sigh. Should you desire to try something at least resembling Fresh Take you can go to a website Kraft has helpfully assembled with substitute recipes. It of course will never be the same, but it's a nice thought. As it is now though, unless you have a local grocery store that somehow is carrying older Fresh Take items (and if it is, make sure they aren't already expired) the odds of you getting to try this delicious item are basically zilch. It's a shame, because I really do miss that Cheddar Jack & Bacon one. Oh well, at least I have my memories. I'm very sad they discontinued it too, I hope the replacement recipes help satisfy your cravings for "Fresh Take" at least a little bit! I miss Fresh Take so much, I remember when I first discovered it, the Chile Lime Panko was my favorite, which was discontinued like a year before they fully discontinued all the flavors. Spicy Chipotle was heaven in the mouth, and now I cannot have it! C'mon Kraft, seriously? One of the best food products ever, if not the best, just GONE? UGH! It's hard feeding finicky males in my home and it's much harder now that Kraft discontinued it's Fresh Take product. Shame on you Kraft! Yes...Shame on You! This was one of Kraft's BEST products ever - PLEASE bring them back!!!! The Southwest Three Cheese was my favorite too! I made this for me and my boyfriend at least once a week - especially after I would buy it using a nifty little coupon! Was so sad when it left, just as I was sad when Hamburger Helper got rid of it's Beef Taco and Pizza flavors and when my local Meijer store stopped selling their Meijer brand Beef flavored noodles (this was bomb to go with shake n bake boneless pork chops or Salisbury steaks.) Well, when I feel like it, I'll just do experiments to find as similar a taste to it as I can.